There are many stories of ghost ships. 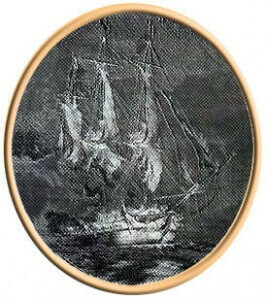 One of the most famous is that of the Mary Celeste. But there is a ship that “patrols” the Bay of Chaleur that puts all the rest to shame. Does the ship haunt the shores because its owners were murdered? Or because its crew kidnapped and abused a young bride? Or was it because a casualty of a famous war? For over 200 years there have been sightings of mysterious “balls of fire” out in the Bay of Chaleur near Bathurst. Some people have reported seeing a three-masted ship engulfed in flames. In fact, former Bathurst Mayor Kevin Mann has reported witnessing it on two separate occasions. And who doesn’t believe a politician? The most common explanation of what ship haunts the area involves two 16th century Portuguese explorers and traders, Gaspar Cort-Real and his brother Miguel, who were seeing a profit trading trinkets with the locals, decided that trading of the locals was a better deal. They invited a group of natives aboard, got them liquored up, chained them below deck and took them back to Portugal to be sold as slaves. The year following the kidnappings, Gaspar Cort-Real returned to the area for a new load but a welcome wagon of nasty was out to greet him. The locals tied Gaspar to a rock at low tied and had a picnic while watching the rising waters slowly take his life. When Miguel returned to Chaleur to find his overdue brother, he was happy to see Gaspar’s ship at anchor in the bay. When he and his men boarded the ship the locals, who had laid in waiting, attacked Miguel’s men. In a desperate attempt to flee, Miguel set the ship ablaze and vowed, with his last breath that his spirit would roam the Bay of Chaleur “for a thousand years”. Another popular story involved the Battle of Restigouche. The Battle of Restigouche was a naval battle fought during the French and Indian War of 1760 between elements of the British Royal Navy and the small flotilla of French Navy vessels sent to relieve New France after the fall of Quebec. It marked the end of any serious attempt by France to keep hold of their colonies in North America, and it severely curtailed any hopes for a lengthy resistance to the British by the French forces that remained. The carnage on both sides of the naval battle almost ensured that some poor soul would get lost and wander the Bay for an eternity. A story is also told of a virgin bride who was abducted and ravaged by a visiting ship’s crew. In retribution for this dastardly act, the culprits found their ship engulfed in flames and their souls doomed to forever sail the waters of Chaleur Bay aboard the fiery vessel. There are less fanciful explanations of the phenomenon of course. Some believe it is a combination of escaping gases, atmospheric conditions, and changing currents. Local historian W. F. Ganong suggested it was a version of St. Elmo’s Fire. Who knows the truth? It doesn’t matter, really. Never let facts get in the way of a good story. The Bathurst Tourism Commission adopted the image of the ghost ship as its own in 2000 in a plaque seen at the right.